On Friday 5th November 1915, at Chippenham railway station, the 4:34 from Bristol arrived bringing the first of the injured soldiers to be treated at Chippenham Town hall, which had been converted to become an auxiliary hospital. These men, injured at the front line, had been treated at a Military War Hospital in Bristol and now arrived in Chippenham to convalesce. The transition was welcomed by the men, discipline was less strict and conditions were generally less crowded and more comfortable. Many would eventually return to the battlefield, for others the war was over and convalescence meant coming to terms with disability and loss of limbs. 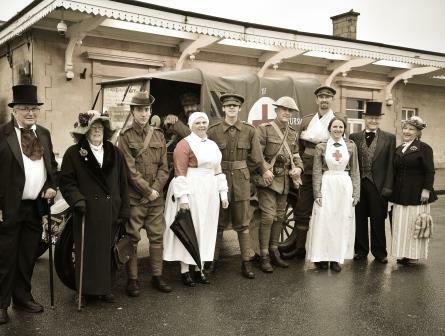 A recent re-enactment of ‘wounded troops’ being greeted by VAD nurses and staff, at Chippenham railway station. Injured soldiers were greeted at Chippenham by men of the voluntary aid detachment, helped off the train and transported to the hospital using cars provided by volunteers and well wishers, a practice which continued throughout the war. To mark the hundredth anniversary the event was re-enacted with actors playing the part of the men and women of the Voluntary Aid Detachment and of wounded soldiers.